Designed to give increased spark energy at all engine speeds. Can be used to drive twin cylinder 250cc kart engines using double ended coil. 512KB FLASH memory for data logging. Sample rates at 20 and 10Hz. Maximum record time approximately 27 minutes. Logging automatically activates at specified engine speed point. Logged data is retained after power is removed. All engine data recorded. 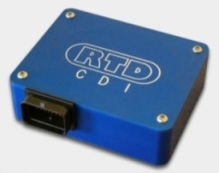 CAN 2.0B (active) interface for transmission of data between ECU and third party dashboard devices. Both specification levels also allow for an optional type-K thermocouple input. 4 position map switch input. Detonation input with 2 level sensitivity and event recorder. CAN 2.0B (active) data output for third party dashboard/logger. Power valve output and associated feedback input. 512KB non-volatile data logging memory.